Commuters may have noticed numerous cottonwood trees north of SR 520 in Redmond that have reached the end of their life. Because they're so close to the highway, they pose a safety risk to drivers. Although it rarely happens, a strong wind from the north could knock the old 80- to 100-foot-tall trees into traffic and that's not a risk we want to take. A generation ago, we would have cut the trees down to the stump and simply removed them from the area. 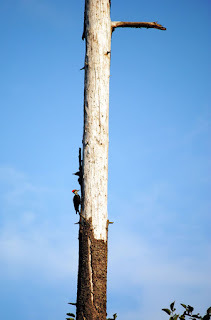 We've learned that leaving a portion of the trees standing in place (essentially “topping" the trees) can be helpful to the environment – especially to wildlife habitat. According to biologists, leaving most of the dead or dying trees, known as snags, in place helps breathe life into the surrounding area in a few ways. Snags provide wildlife a place to nest, find food, and court mates. Over time, snags decompose and provide valuable nutrients to nourish nearby plants and streams. Several dead and dying trees shown here next to SR 520 near Redmond will be topped during an upcoming project. Starting the week of September 17, we'll begin to remove the treetops. Our maintenance crews will close a westbound SR 520 lane to do the work and Washington State Parks crews will work 10-hour days for up to four days to perform the work. They plan to be strategic about what part of the dead trees they will remove. Left standing will be 30- to 50-foot-tall tree snags. And we likely won't haul away all of the tree tops cut from the dead trees – much of the material will be placed on the ground to naturally fortify the area. The snags will be far enough away from SR 520 to not pose a risk for drivers but close enough to help enrich Redmond's adjacent Bear Creek habitat area. 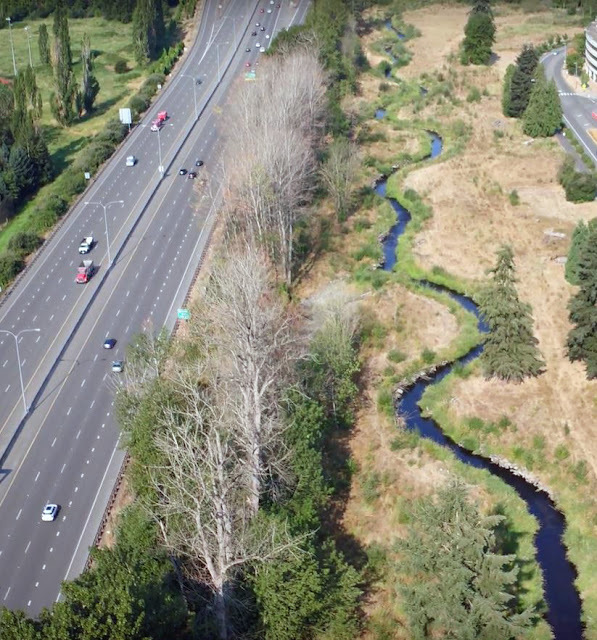 A brief history of the area: In 2015, as part of the Bear Creek Restoration Project the City of Redmond enhanced Bear Creek by adding curves, bends, and wood to the stream, and planting thousands of trees and shrubs along the banks. The restoration project improves habitat for fish in Bear Creek as well as wildlife along the stream banks, and the snags will expand opportunities for wildlife to flourish. We're not doing this alone. 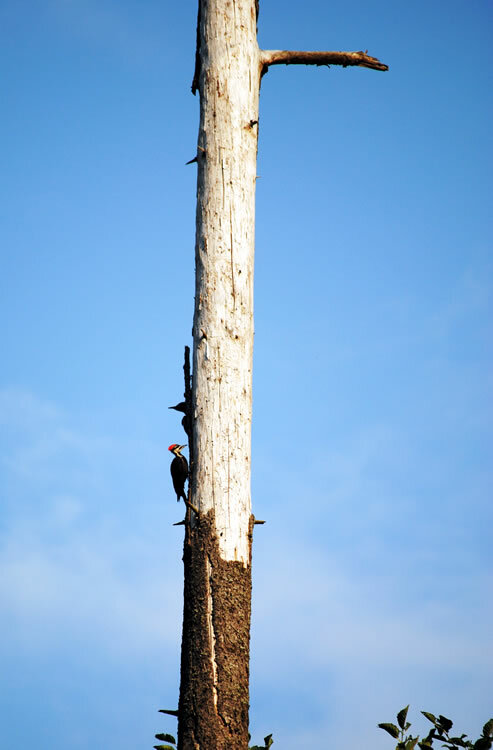 We're working closely with the City of Redmond, Washington State Fish and Wildlife, Washington State Parks, and the Muckleshoot Indian Tribe to make this tree loss a silver lining for the environment. We made a lot of progress and there are only a few dead trees remaining that need to be topped. To do the work, we’ll return to the area Friday, Oct. 5, between 10 a.m. and 4 p.m. During this time, the right lane of westbound SR 520 will be closed between Redmond Way and West Lake Sammamish Parkway Northeast. There's no mention of what trees you'll be planting to replace the bird habitat, shade, and other benefits of trees. How many trees are you topping? If you top a lot it could look pretty bad. The treetop removal was a safety concern since the trees were close enough to SR 520 that a strong wind could have toppled them onto the freeway. We used emergency funding to do the work and emergency funds don’t pay for replanting. But there’s a silver lining. We were able to use the tree tops and some large trunks to shade the creek and provide habitat for birds and other wildlife. Also, as part of the Redmond’s Bear Creek mitigation project, the contractor planted hundreds of native trees in the area in 2015. So there’s new growth and now plenty of nutrients to keep this area vital for years to come.